There’s no doubt that this is the age of unprecedented communication opportunities. We have more channels, more media, more methods, and more ways to communicate with people than we did just a decade ago. But good communication skills involves more than just blasting out a few tweets on Twitter. Good presentation skills involves more than being adept at pasting videos into a website. As public speakers, communicators, and presenters, we have to know what to say, when to say it, to whom we are saying it, and why we are saying it in addition to how we say it. 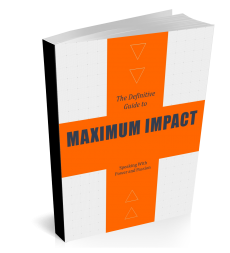 In this manual, Maximum Impact, we review four ways people communicate their message. And we address how you can use these methods to improve your communication and presentation skills. With the ideas in this manual, you will look beyond the technology you use to deliver your message and focus on you as the message, insuring your message is delivered, heard, and understood, regardless of the technology you use. What We Do: In this first session, we’ll review the behavioral aspects of your communication styles and how your actions impact your message. How We Look: In the next session, we look at the visual components of your message and how they impact your delivery and acceptance. What We Say: In the third session, we’ll review the importance of your wording. By choosing specific words, you can specifically tailor the meaning and intent of your message. How We Say It: Finally, we’ll review how pauses, inflections, and pacing can make or break your messaging. With the technology you have at our disposal, you can reach thousands of people around the globe. But that reach is of little consequence if you can’t deliver a consistent and coherent message. Download this manual today and insure that you are making the maximum impact on your audience.